Our bed bug detection dogs and handler are certified as bed bug detection dog teams through Integrated Bed Bug Management Association. Spice is a focused, intelligent three year old dog. She is part Belgian Malinois and part Border Collie, both known for their strong olfactory capabilities and drive. Yet Spice is a petite 26 pounds making her ideal to get into small spaces. Don’t let her size fool you, she is agile and has been known to climb ladders when searching. She is a single purpose dog and only trained in one detection discipline so her focus is entirely on bed bugs. She is trained on and has found as little as one bed bug. Shamus is a Border Collie cross. He is currently in training as a single purpose bed bug detection dog. We expect that he will be working with Spice by the summer. Although the majority of Bed Bug Detection Teams purchase trained dogs, Kay has the expertise and knowledge to select and train her own dogs and continues to reinforce the training on a daily basis. 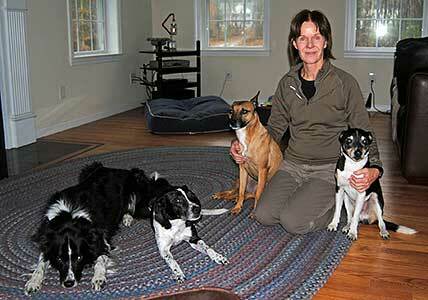 Kay trained Spice and Rio and has trained dogs at high level activities for over 20 years. She is a member of the Massachusetts Canine Response Team (www.macrt.net). She has two certified dogs through the Massachusetts Search and Rescue Dog Federation (www.MASSARDF.org) and is called out on searches for missing persons by state and local police. Poppy is an advanced human remains detection dog. Kay is also an evaluator for IBBMA and MASSARDF as well as a judge for the National Association of Canine Scent Work NACSW. Bed Bug Detection K9s We are very thankful to Kay and Spice at Bed Bug Detection K9s! They are a great and most efficient team. Kay was easy to work with. She patiently answered all of our questions. Our neighbors across the street and family have also used Bed Bug Detection K9s. We’ve all had positive experiences working with Kay. Thank you Bed Bug Detection K9s, Spice and Kay! We highly recommend this company! Jeremy D.
Bed Bug Detection K9s Kay and Spice were fast, accurate, and very professional. An infestation is emotional and physically burdensome but just their presence alone made us feel so much better. They were a delight to have in our home despite the circumstances. Totally worth it! Billy B. Bed Bug Detection K9s Returning from a business trip, I discovered I was covered with angry bed bug bites all around my neck, arms and wrists and chest. ( This was confirmed by a dermatologist.) Naturally, I was worried that I had brought the bugs home with me in my suitcase. Kay, at Bed Bug Detection K9s, came over with her dog, Spice, to inspect my home. They made a thorough inspection twice and found no bugs much to my relief. Spice was a very focused and well-behaved dog. I appreciated Kay’s several follow up phone calls to make sure I hadn’t developed any new bites or noticed any further evidence of bed bugs. ( I hadn’t.). I highly recommend the service from Bed Bug Detection K9s. Beth H.
Bed Bug Detection K9s Although a bed bug scare is never a pleasant experience, Kay did an excellent job in easing my anxiety. She was pleasant, honest, professional, and was thorough in answering all of my (many) questions and concerns. After Spice, her dog, found no bed bugs in my apartment, Kay said she would be willing to come back if I found any evidence of bed bugs (I haven’t found any – I think I was just paranoid to begin with). She also was nice enough to follow up with me a couple times to make sure that I was still bed bug-free. I would recommend her to anyone looking for a reliable bed bug detection service. Nicole M.
Bed Bug Detection K9s Being a heavy business traveler, bed bugs have always been in the back of my mind. Coming in contact with them is another level. Kay was amazing in dealing with our situation. She and her dog Spice came out to the house and did a full inspection. She was extremely professional, patient and kind, taking the time to answer all my questions and paranoia. Kay followed up several times to see how we were doing. I would highly recommend Bed Bug Detection K9s to anyone in need of this service or peace of mind. L. Ann S.